God loves it when we give. He is a giver. He created us in His image. It is only fitting that we copy Him! “Give Generously Because You’re Blessed Be Blessed Because You Give Generously” wall words look amazing in these two rooms. 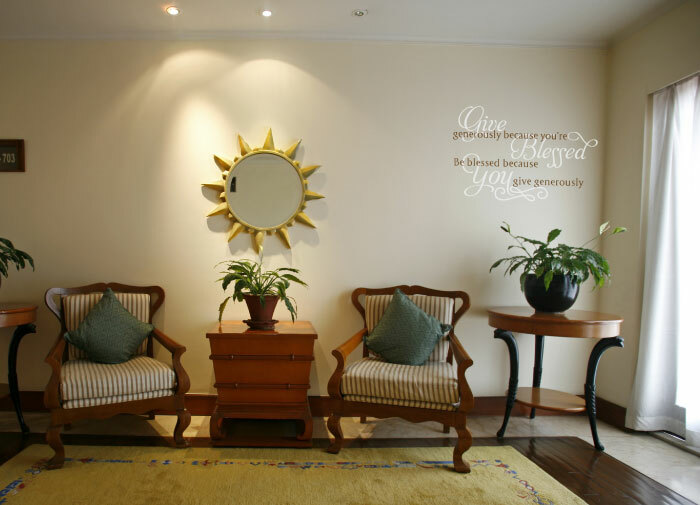 They show how the same wall lettering used in different rooms can have the same stunning results! They look great next to the sundial decor in this family room. They tie in well to the accent pieces in the room: black flower pots, green potted plants, floor length sheers and the eye-catching carpet. Our wall letters in the entry room tie in well with the dark barrister. The chandelier and recessed lights make the room cozy. The light does not negatively affect the wall quotes being matte. The bench below the wall letters is the perfect spot to reflect on the awesome message. Are you looking for unique and affordable wall decor? 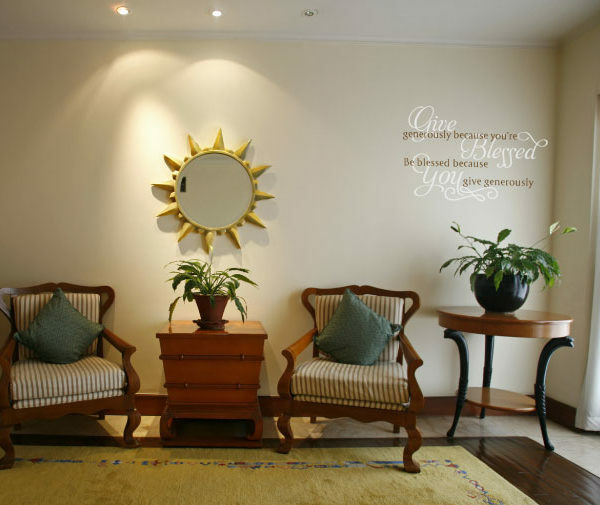 Try wall quotes from DecorativeLettering. They are suitable for all the rooms in your home, from the entryway to the bedroom! We also make sure that they fit in with all lighting environments. You will be able to view and read without any glare problems. They are also easy to apply. All you have to do is peel and stick the adhesive side of the wall lettering onto the wall. It is that simple! Do get in touch.